Such a beautiful story. Love it! so true...i am only beginning to realize. Grant, that is so sweet! Let's open our eyes. Now, it's like a movie in my head-- thanks to you. Saw you reblogged on tumblr! And came here! It spoke volumes to me. This is so true it hurts a bit. I wish I could get to the point where it's a valuable life experience but that's a long way to go still. I have the one thing I love and that's all I care about. Thats kind of cute, isn't it... And true too. Which is eminently scary.. This is the finest thing I've seen you create. Never lose your sense of whimsy! I really think your comics are wiser than a lot of philosophy!!!!!!great!!! Very neat explanation of something, sometimes hard to explain. Great comic! 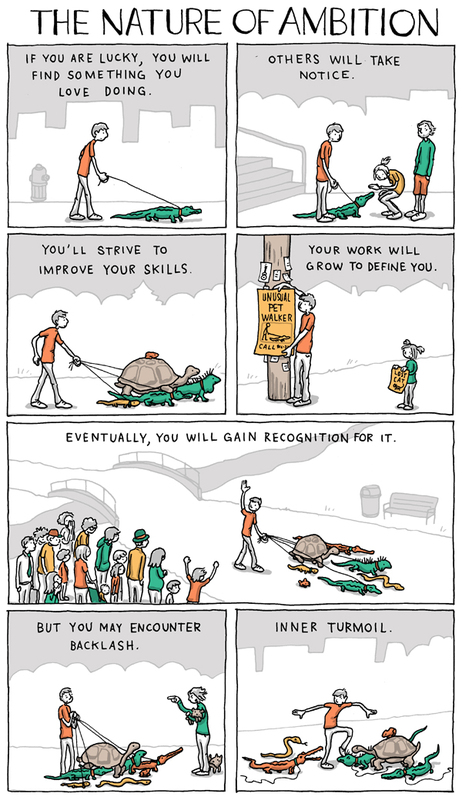 That's brilliant life advice presented in a beautiful comic. Ambition is a great thing, but just like almost everything else has to be in moderation. So if you lose sight of where you began and what got you going, in the end when you look back in life, the scene may not be pretty good. Grant, it feels like you made this for me! I had a pet-sitting/dog-walking business from age 7-17 because I love animals and was an entrepreneur...eventually worked at a cat hospital for 3 years in high school, which killed my desire to become a vet (too routine)....also volunteered at the zoo...As an adult, I am an indie designer with a popular tshirt line and still feel the same as your comic...self doubt, desire to be better at what i do, backlash, ultimately love design...thanks for creating this!!! You don't necessarily have to go back to where you started when you go miserable. You just have to keep in mind where you started and all is gonna be well. @Anonymous: very cool, glad you can closely relate! This is what i needed to see exactly right now. I just washed out of a tremendously intense program. A highly ambitious program I had sought out for years. I sacrificed all of my free time, all of my work time, my personal life for this program. I failed at the end. It was the first thing I've ever actually failed at in my life. In the end, when the dust settled, I realized that the girl I love was still there. Despite neglecting her, never being around, spending all of my time stressed out and exhausted, and taking it out on her she stood by me, weathered the storm, and picked me up when I fell. and I will love her forever for it. This reminded me of some of my favorite Dr Seuss stories - fun story and beautiful illustrations, with a powerful message that kinds of sneaks up on you, which makes it even more compelling. Well done! :)) It's great...love your post! Well done my friend. I know how difficult it is to combine art and apparent philosophy. I really liked your cartoons. I don't know why these cartoons made me remember Calvin and Hobbes. Thank you very much for sharing your creative work. Awesome. It's very true.It's like the Japanese fisherman who was encountered by the American business. Lying on the beach, the Japanese man was lectured on how he could work harder than just lie down like that so that he could have greater business, form and empire, earn huge profits, go for a vacation and rest at the beach under the sun, to which the small time Japanese fisherman replied, "Isn't that what I am doing now?" Great illustration. Ingenious idea. Keep it up! Reality of life described in simple sentences and comic strip. Amazing piece. Sometimes it's always better to stick out to one thing specific thing first before venturing to a bigger responsibility which means you have to once again invest bunch of effort and care. Just like in having a pet you have to concentrate in caring a one or two pet first because if you decided to adopt or have more the tendency would be there's a possibility that you neglect the other they will go away from your care. That's why it's important to know your priorities and what do you want to do first. effing great. This struck me to the core. This is how humans are consumed by fame. Very true and convincing. The road to great of course has such steps to be followed and probably the consequences as well. But still who dares wins....and the rest who do not dare read the history and increase the knowledge....to be passed on to the kids and the history goes on!!! Try again, learn from mistakes (when you can't handle them anymore)... success is waiting for you. Aww, Grant, as always, simple and convincing with a wonderful message. Thank you very much. 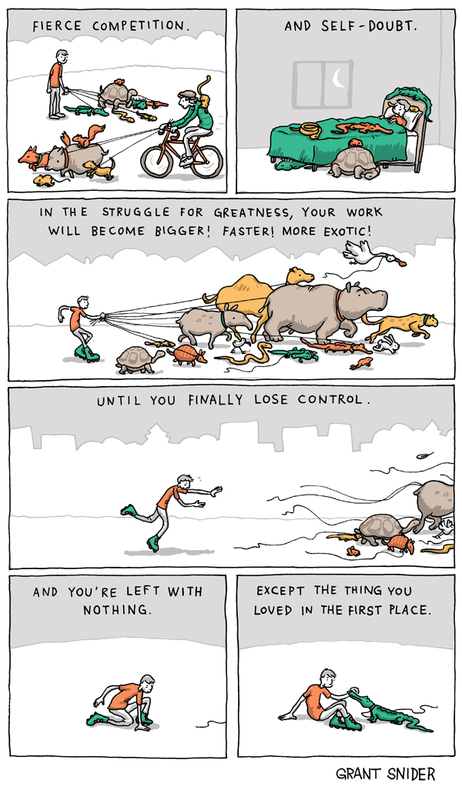 Hello Grant: Beautiful and insightful comic for it does say much. One of those in particular is that IF True, that the nature of ambition as stated THEN that nature ends with what one begins with. I don't believe that part is true as much as the comic storyboard itself perhaps means to communicate that said nature is cyclic from the get-go. Just saying. BTW: thistle is not a robot. kingdom for each one of us; and true progress is to know more, and be more, and to do more. See the link below for more info. I know this is an old thread but I just saw this cartoon and I want to thank you for creating it; it really means a lot to me. Brings me to tears every time I read it. I was cursed with being "creative," thus doomed to a miserable and lonely existence, and this cartoon provided some desperately needed comfort and affirmation. Just want to reciprocate and say your art made a difference in someone's life. Thank you! The final message of this is the stupidest thing I've ever read. Ambition is not a problem. Hey Grant! Do you have a poster of this one? It's too awesome to just lie around on the computer screen. It needs a wall. Such a true thing !! Most often it happens in our life. Warm. Do what you love. See yourself again. This is life. We have to recognize ourselves truly. Awesome story!! I like it much. What a great story, and the ending is sad but sweet. The one who stay is the one who worthy to receive our everything. Thank you for sharing. Great and true story. Teaches reality of life. Thanks for sharing. I love this comic. Sometimes things get out of control. Sometimes all you got to do is go back to what you loved. I completely agree. And it was beautifully described here in this comic strip.